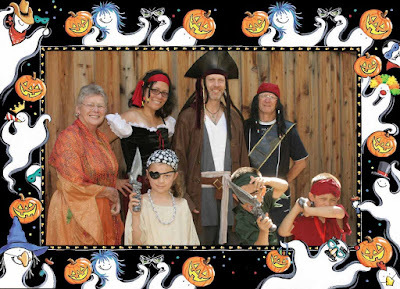 Here's a treat for all you landlubbers: some Halloween pirate jokes! What's a pirate's favorite Halloween candy? MaArrrrrs BaArrrrrrrrs and StaArrrrrrburst. A little boy is trick or treating on Halloween by himself. He is dressed as a pirate. At one house, a friendly man asks him, "Where are your buccaneers?" The little boy responds, "On either side o' me 'buccan' head!" What do a pirate and a gangster have in common? They both say, "Yo Ho" (okay, that wasn't Halloween-themed, but I couldn't resist). And you don't even have to be a buff, tanned poolboy to win it....... In case you haven't entered yet, my Wonder Bread giveaway ends November 4 -- you've only got a few days left to enter to win a $100 Visa gift card and a year's supply of Wonder bread! 3Po and Jammy have been set on their Power Rangers Halloween costumes for months, so I was taken by surprise when they decided they wanted to dress up as pirates for last weekend's Halloween party. But I quickly rallied. I simply opened up my "old clothes" bin and took out a couple of shirts and trousers that the boys had outgrown. I cut up the ends of the pantlegs and shirtsleeves into zigzags, and pieced together the cut-up sleeves to make headrags. Then I threaded some beads onto elastic bands and looped that over their ears to make dangling earrings. I got creative with Jammy's shirt by slitting the front, poking some holes on either side of the slit, and threading through some black string to make a lace-up front. Slip on an eyepatch, wrap a black scarf around their waists, and Avast! 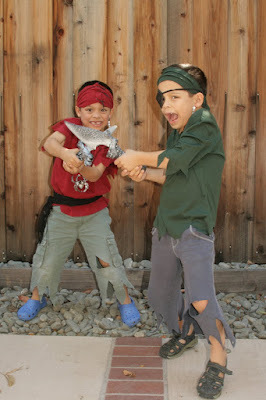 A wondaArrrrrrrful homemade pirate costume! 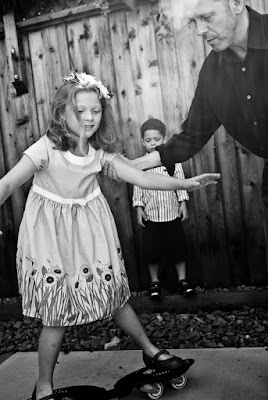 Visit the Wordless Wednesday site for more entries. And don't forget to leave your links below so I can visit your entries as well! When I go on vacation, I don't like to wing it. I like to plan and be prepared. I'm all for experiencing little surprises along the way, but for the most part, I like knowing where we're going before we go, and what we're doing before we do it. So before every vacation we take, I try to spend some time reading about our destination, what it's like, what to see, and what to do. 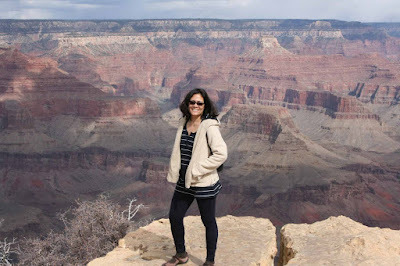 I knew the Grand Canyon would be grand, but I was unprepared for the vastness of it all. We couldn't see the canyon at all when we were driving to it. We kept looking around and everything around us for miles and miles was just flat. And then all of a sudden, the ground ended in front of us, and we realized we were actually up on the edge. The earth opened up, and it was like a huge hole had been dug out of the planet. Can you see itty-bitty Alfie on the edge of that cliff? See the bottom edge of the photo? That's not even halfway down. For some reason I thought the canyon would be narrower. Instead, it's a huge chasm that's miles across. When you stand on the edge and look out, you truly feel insignificant. My words and photos just don't do it justice. I'm not sure anyone else's can. In my mind, Arizona = desert. Boy, was I wrong. I didn't expect to see pine forests, but both the northern and southern rim are covered with pine trees. 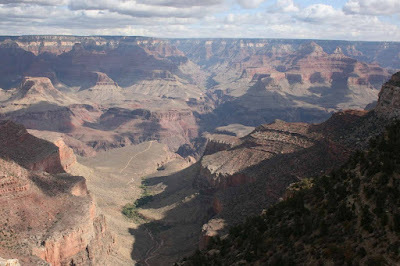 When you look out at the Grand Canyon, the whole top part is covered by a thin, deep green carpet of trees (and it really does look like a carpet, not like individual trees, because they are so far away). I didn't expect it to rain, either, but it did. Yup, it rains. And hails. And snows. When you look out over the canyon, it's not uncommon to see birds soaring, drifting on the curents like the magnificent, free creatures they are. 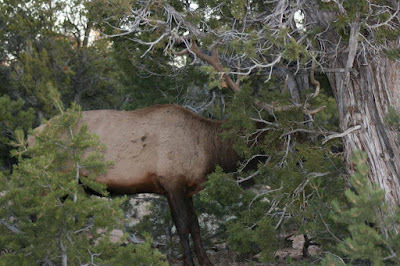 We also saw tons of elk and deer on the roadside, crossing the roads at night, even grazing on the lawn in front of our hotel room! Frankly, I'm amazed that these animals venture so close, what with all the headlights and the camera flashes. That must be one sweet lawn. It seems like there's no such thing as wilderness these days. Some people might find that sad, but I'm all for it. We had cellphone coverage the whole time, and our hotel had excellent wireless internet access in the lobby. Don't worry, it's not totally developed: I did have to change my route to the lobby because there were a bunch of elk blocking my path. We were at the Grand Canyon from about noon on Monday till about 4PM on Wednesday. 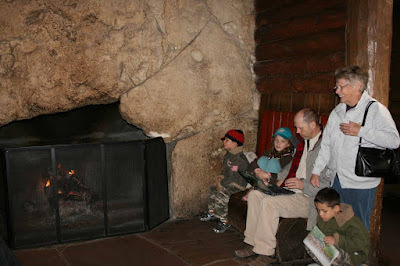 Alfie wondered whether we'd sit around with nothing to after we got to the Grand Canyon and took a few photos. But afterwards, we both agreed that our vacation could have lasted a week without running out of things to do. 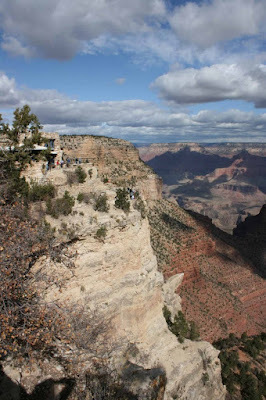 Granted, you could hit all the most famous landmarks of the South Rim in a day (a very looong day), and indeed, many people do. But it's a tight squeeze, because each place you stop at has a different view of the Canyon, and each time you stop you want to take a whole new set of photos. 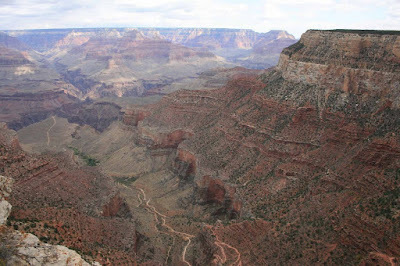 Besides, the Grand Canyon is more than a series of photo opps connected by bus or car drives. I'd have liked to hike the Rim Trail and Grand View Trail for more than 10 minutes. I'd have loved to bike on trails that wind through miles of forest. If we had even more time, I'd have loved to get all the way to the bottom (although I don't know whether I'd trust the mules to take me down, or trust myself to hike all the way back up). I'd have loved to get on a raft and ride the rapids (just the small ones). I'd have loved to make side trips to Sedona, Havasu Falls, and the Sunset Crater Volcano. I'd have loved to hang out in Flagstaff and get my kicks on Route 66. But we can't really complain. We saw the Grand Canyon. Okay, it's a stretch. Hey, her sweater is tied around her waist. Alright, I'll admit -- I just wanted to show off the photo. But if you had over 400 photos of one of the 7 Natural Wonders of the World, you'd want to show them off, too. Can you guess which Wonder of the World this is? No, not the girl, I mean the place behind her! Stay tuned for more photos from this vacation for my next few Photo Hunt entries! For more tied things, visit the Photo Hunt. 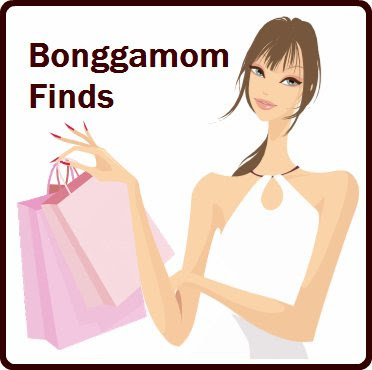 And don't forget to leave your links below so I can visit your blog! Last week Alfie sent me an article that made my blood boil. Just think -- if Alfie and I had applied for a marriage license in Lousiana instead of Nevada, we might have gotten stuck with that asswipe, he'd have refused to marry us and we'd still be living together in sin. Thank goodness Elvis is a much more tolerant justice of the peace. And thank goodness the Bay Area isn't like that. It's sad to think that he would deny us marriage because he's taking pity on our three beautiful, intelligent, confident children. And he dares to think he isn't racist. 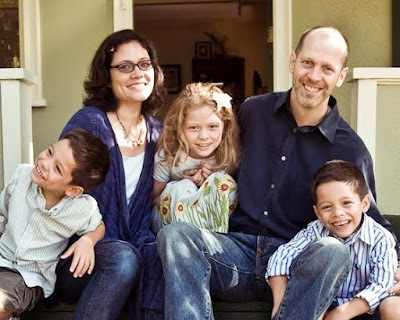 Click here to read my Silicon Valley Moms Blog post about Keith Bardell-- and feel free to leave a comment to add your two cents to the discussion! This is a compensated review from BlogHer and Wonder®. Keep reading to find out how to win a $100 Visa gift card and a year's supply of Wonder® bread! This week for the Photo Hunt we get to showcase any photo we want. Miss TN Chick says it's a free week, but I'm going to take it literally and post a photo of something FREE. As a blogger I've been so lucky to receive free stuff to review. Quite a lot of it is for the kids, and obviously they really enjoy it. One of the things I've received that the kids have really really loved -- and still do -- is the Shred Sled. The technical name for it is caster board, but my kids call it a wiggle board. It's like a self-propelling skateboard; you twist your torso and wiggle your legs around to make it go. It's so much fun, even Alfie and I like using it! I still can't believe they sent these to us to try and review. Gotta love blogging! If you want to find out more about the Shred Sled, click here to read my review. And For more Photo Hunt entries, click here. And don't forget to leave your link below! Two weeks ago I got visited New York City for the first time in almost a decade. In the past, when I've traveled to NYC on business, I've always tried to spend some of my free time soaking in the best of what the city has to offer. This time around, I had about a day and a half of free time. And what did I do? I went to the American Girl Place on 5th Avenue. This is what being a parent does to you. I could have seen a play on Broadway, or gone for a run in Central Park, or walked among the beautiful works of art at the Met, but no, I had to go and look at overpriced dolls and fantasize about buying the whole lot for The Pea. 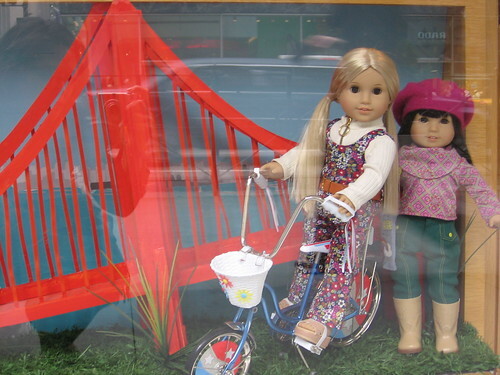 But enough about my ambivalent feelings about American Girl; this is supposed to be Wordless Wednesday. Here are some photos of the store. Other than a few souvenir items, this AG Place has the same stuff as the AG Place in Chicago (I actually posted photos of my visit to the American Girl Place in Chicago several Wordless Wednesdays ago) . Only the layout and the storefront displays were different (although I'd guess the displays change periodically and it's likely that the displays in Chicago are identical to the ones on NYC at the same point in time). I personally like the storefront of the Chicago branch, with it's tall glass windows. It's nice to see the Golden Gate bridge. Not so nice to see Julie's 70's pantsuit. I have vivid memories of wearing clothes that looked even more hideous than that. 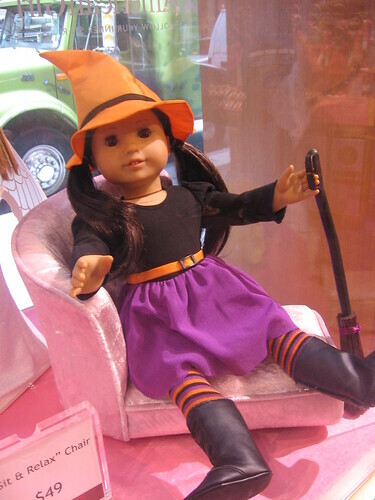 I love this little witch's outfit. It almost looks as though I could sew it myself. 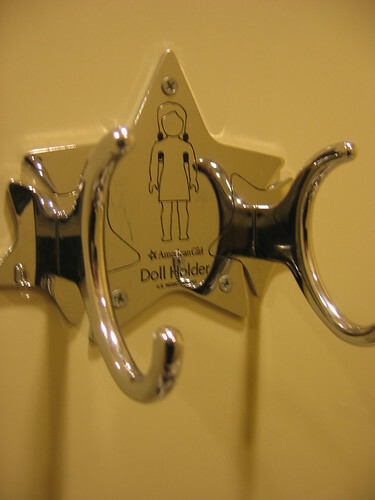 This is something you don't see in your everyday public toilet stall: a place to hang your doll. I was enchanted enough to take a photo (I did make sure I was alone in the restroom because I didn't want people to think I was some kind of perv). I suppose a doll holder takes up less space and breeds less germs than a doll toilet alongside the real one. I love Kit's treehouse, and I'd love to put this under our holiday tree this year. But we'd need to buy a bigger house in order to store it. And we'd need to be rich enough to buy a bigger house in order to be able to afford to buy the treehouse. 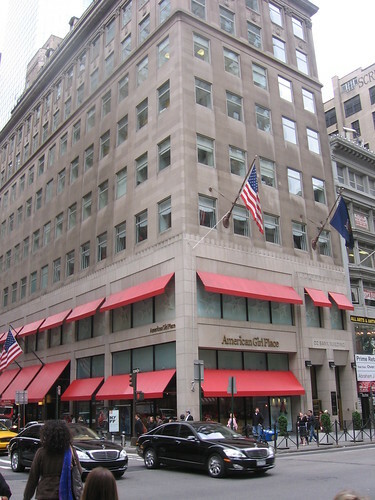 For more photos of the American Girl Place in NYC, check out my Flickr photoset. And click here for more Wordless Wednesday entries. Finally, please leave the link to your WW post below, I promise I'll drop by! Today is the Silicon Valley Moms book club discussion day for October, and all I can think about are babies. Every day I see dozens of babies in strollers when I drop the kids off at school; they're looking particularly adorable these days, all swaddled up in thick coats and hats to protect them from the wind and the rain. I paid special attention to babies today because my brother and his wife are going into the hospital today to deliver their first baby via C-section. She's got placenta previa, so I'm keeping my fingers crossed that everything is going to be alright. They live all the way in far-off Bahrain, which I know next to nothing about, so I have to keep warding off all kinds of stereotypes about the state of development in that part of the world. I'm pretty sure Bahrain is as modern as Dubai, and if celebrities like George Clooney and Matt Damon can vacation in Dubai, they must have great hospitals that give world-class care. Still, I think I'll breathe a lot easier once that baby is out of her mama's tummy and all her fingers and toes have been counted. So what do babies have to do with this book club? 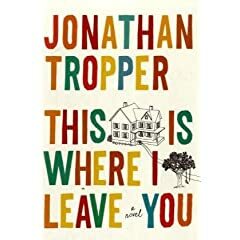 Actually, babies figure prominently in October's book, This is Where I Leave You. The main character's marriage really begins to unravel following a tragic, late-term miscarriage. 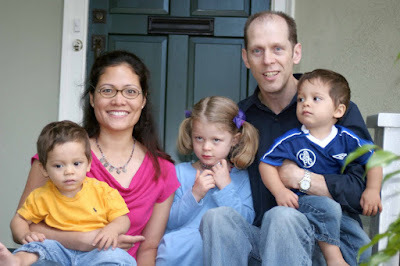 This happened to a friend of ours; at about 30 weeks, his wife went to a prenatal appointment and discovered that the baby's heart had stopped beating. I remember driving him to the hospital from work and how awful it all was. A year later, the wife became pregnant again; now they have two healthy boys, and although they mourn their little daughter's passing, they've moved forward and life is good. Of course, things could easily have gone the other way, as it did in this book. The tragedy is compounded because at precisely the time a couple should be able to lean on each other and become closer, the couple in the book, Judd and Jen, drifted apart. But I can see how that could happen. In a few of my more paranoid-morbid moments, I've wondered about what Alfie and I would do if, God forbid, anything happened to our children and we were left with just each other. In a situation like that, it would be all too easy for each of us to retreat into our own shells. I don't know if I would have the strength to go on living, let alone keep my marriage going. Would we go the same path as John and Louise? Or Judd and Jen? You know that saying, Having a Baby Changes Everything? Well, not having a baby can also change everything. But enough depressing thoughts. I'm going to be an aunt today, and I'm counting my blessings. Jammy, put your helmet and elbow pads and knee pads before you go out skateboarding. But I don't need them! Yes, you do. Do you want to break a bone just before we leave for the Grand Canyon? Do you want to be sick when we leave for the Grand Canyon? Okay, mama, I'll take my medicine. Mama, can you buy me some candy? You know, honey, we're going to the Grand Canyon next week, so we'll buy you a pack of gummi bears to chew on the plane. M & M's family went to Disneyland this summer. I wish we could go to Disneyland too. 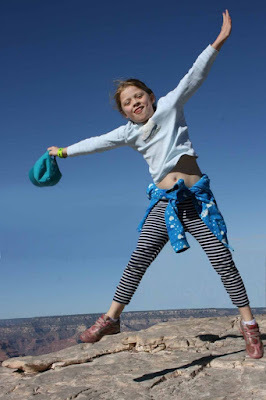 This Grand Canyon had better be freaking AWESOME, otherwise my parenting credibility is shot. 3Po has had a rotten week. 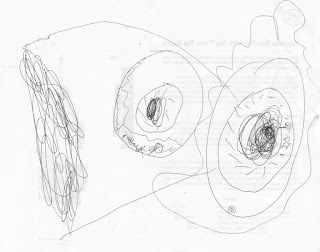 On Monday, he was sent home from school because the school nurse thought he had pinkeye (he didn't). He stayed home from school on Tuesday and Wednesday because he had a bad cold. He made it through school on Thursday, but at basketball class on Thursday afternoon he began rubbing his eyes and five minutes later his eyeballs were swollen. He kept rubbing his eyes, and now they are badly infected. Jammy: 3Po, better BLURRY than BLIND! If I thought I'd end up looking like Spongebob Squarepants, I'd take my medicine in a hurry. If you're English, you'll recognize these well-known sports figures. Even if you detest football, even if you buried your head in the sand, you'd recognize them (trust me, ask my mother-in-law). John Terry playing for Chelsea at the Stanford Stadium in 2007. We were so close to the pitch, we could almost feel the sweat as they ran by and whipped their heads around. The England national team, circa 2008. Here's my best guess, L-R: Ashley Cole, Wayne Rooney, Rio Ferdinand, Shaun Wright-Phillips, John Terry (I think the last 2 on the right are coaches or trainers). Did I get it right, Alfie? Was I actually listening to you scream at the tv? 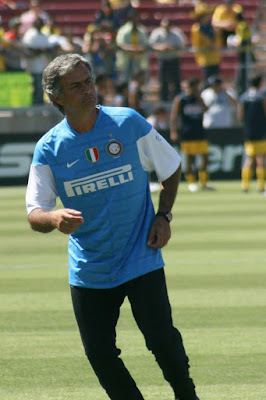 The Special One (Stanford Stadium, 2009). If you don't know this guy's name, you're not a football fan. For more sports, head on over to the Photo Hunt. And if you do comment, please leave your link in the Mr. Linky below! Have your heard of CNN Heroes? Every year, CNN gives $100,000 to the winner (from a field of ten finalists---winnowed from 9,000 nominees from all over the world) of its "Hero of the Year" award. This year, a 28-year-old Filipino, Efren Peñaflorida, made it to the top ten. (A panel of 12 well-known personalities from various fields picked the finalists. Colin Powell was among the judges this year). If Efren wins this year's award (based on how many votes he gets, which will depend on us), he will be able to expand his mobile school program, Dynamic Teen Company, for the children of the slums in the Philippines. What this young man is doing to improve the lives of the kids in the slums is truly inspiring, and I think his efforts are worth my vote. Voting is open between now and Nov. 19, and it takes less than a minute to click a button to cast your vote. The more votes Efren gets, the greater his chances of winning the "Hero of the Year" award and the $100K. Let's all vote for Efren and help him continue to make a difference in those slum kids' lives! Please don't forget to pass this on to everybody you know---Filipinos and non-Filipinos alike----so more people can vote for this young man with an extra big heart. Same backdrop, same positions (L-R: 3Po, me, Pea, Alfie, Jammy), same grownups. Aside from our hairstyles, Alfie and I look pretty much the same. I've even got the same necklace on, and Alfie is wearing the same shirt. (Neither was done deliberately, and I swear, we do have other nice clothing and accessories). But who are those little strangers in the first photo? 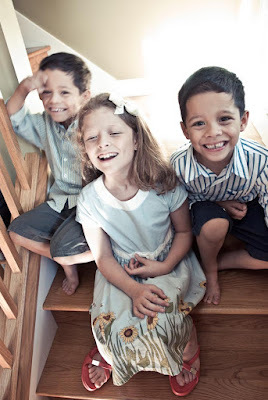 It's amazing how much the kids have changed in four years -- from babies to children. I'm scared to think of how much they're going to change between now and our next portrait session. Third grade brings with it a whole new set of challenges, not the least of which is a renewed emphasis on writing. The Pea and her classmates write essays and letters and journal entires every single day. 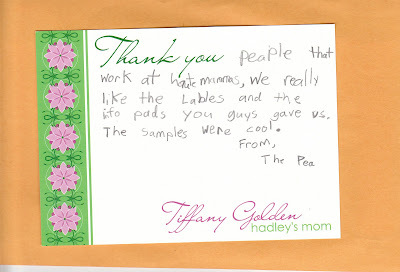 Here's a note she wrote to Hautemammas.com when I reviewed their line of stationary products. For more words, head on over to the Photo Hunt. And if you do comment, please leave your link in the Mr. Linky below!